This view down Bells Gap of Logan Valley is accomplished from the old railroad bed at Point Lookout. 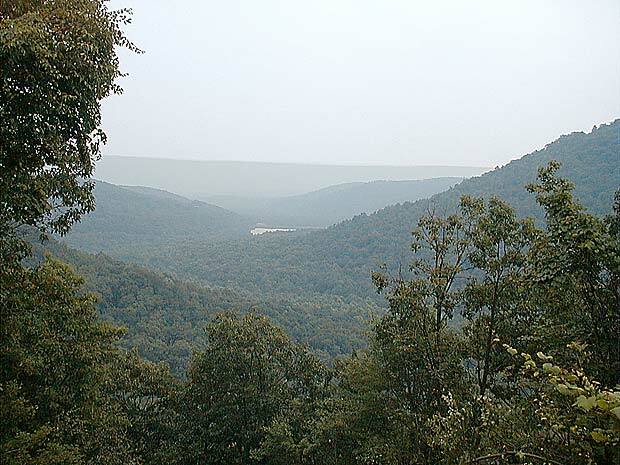 The southeasterly vista is highlighted by the Bellwood Reservoir, the foothills of the Allegheny Front and Brush Mountain in the distance. With an elevation of 1900 feet, the vista stands 500 feet above the reservoir (center of photo) and nearly 900 feet above the borough. This hazy July day illustrates the distance of about 8 miles to the top of Brush on the horizon. For a winter view of this Bells Gap from the power line on Brush Mountain in the distance, click here.